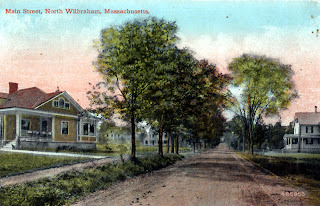 Left from North Wilbraham on a hard surfaced road is Wilbraham, 2.1 m., the geographical center of the township. Wibraham Academy, founded in 1817..., occupies the group of brick buildings on the hill... In 1911 it became a college preparatory school for boys after having been a co-educational institution for 94 years. On Dipping Hole Rd. is Peggy's Dipping Hole, so-called because on a certain winter Sabbath morning one Miss Peggy, who was riding to church on horseback, broke through the ice and was 'dipped' in the freezing water. Left from Wilbraham is a mountain road to the Lookout Tower, 1 m., on the summit of Wilbraham Mountain, affording a view of the Connecticut River Valley and the Mount Holyoke range.